A French composer born June 8, 1954 in Lyon. A musicologist by training, Bernard Fort was the co-founder in 1976 of the GMVL (Groupe de Musiques Vivantes de Lyon), a studio of acousmatic music. Laureate of Bourges Prizes in 1981 (Le Tombeau de William Byrd) and in 1993 (12 Haïku and L’impatience des limites), of the Villa Medici Fuori-i-muri Prize in 1996 as well as of the Chasseurs de Sons Prize of France Culture in 1994, 1995 and 1997, he composes mainly acousmatic music. His research concerns concert equipment and the modes of representation of the acousmatic arts. Bernard Fort is interested in the limits of abstraction and figuration, the natural and the cultural. He has gradually intensified his activity around natural sound landscapes (7 Paysages canadiens, 1996; Les Chants de l’Altaï, 2005) and ornithology (Compositions ornithologiques, 1996; Fouillis d’oiseaux, 2008). The author of numerous teaching books, he teaches electro-acoustic composition at the École Nationale de Musique in Villeurbanne. Bernard Fort was born on 8 June 1954 in Lyons. Passionately devoted to music, he undertook various experiments in the field of pop music between 1971 and 1977 while studying musicology. He obtained a degree in modern and contemporary music at the faculty of Lyons II (1977), followed by a master’s degree in musicology at the university of Paris IV-La Sorbonne (1979) and finally a DEA at the faculty of Saint-Étienne (1980). In 1976, with Marc Favre, he founded the Groupe de Musiques Vivantes de Lyon (GMVL), the first studio for acoustic music in the Rhône-Alpes region. As head of the GMVL he has organised events and courses in the studio itself but also in schools and universities, music schools, conservatories, ‘écoles normales’ and visual arts schools. He has created much teaching material in collaboration with the publisher Fuzeau and supports many pedagogical events such as the Clavichords seminar in Bourg-en-Bresse, the AGIEM congress in Lyons, academic and inter-academic training courses for music teachers, the Commission de Recherche Informatique et Pédagogie and other events at the MIDEM in Cannes. Thanks to the composer’s wide-ranging presence, a multitude of concerts have been given in Lyons, in the Rhône-Alpes region, as well as all over France and abroad. In 1981 he created a concert cycle of the GMVL, also organising live encounters, entitled, in 1989, ‘Teaching tools for contemporary music’, in 1991, ‘Towards the acousmatic arts’ and in 1990 ‘Acousmatic Europe’. With Xavier Garcia Bernard Fort prepared the ‘Acousmatic machine’, the main part of his research devoted to concert layouts and the modes of representation of the acousmatic arts. He has often worked with the Groupe de Recherche Musicale (GRM) at INA. He composed De l'autre côté du miroir (1986), a work intended to illustrate in music the possibilities of sound treatment provided by the GRM’s 123 digital studio. The modes of treatment used involve the accumulation of sound onto itself, stretching and contracting, resonating filters, mixes and reverberations. Fort’s musical output is entirely devoted to the acousmatic genre. In composition he is interested by the boundaries between abstraction and figuration, between the natural and the cultural. For him the point is to observe sound and the natural model, to order to compose with sound objects, to spatialise, to enhance. Fractals, composed in 1980, is a succession of short pieces based on a single concrete sound source. The work explores the fields of tone-colour, rhythm, form, space, for complex and varied concert stage layouts in relation to the venue, the ordering of the pieces and the performer. In 1981 he won the Bourges Composition Prize for Le Tombeau de William Byrd. This works combines both periods and media, playing on the alternation of six harpsichord pieces of William Byrd and five pieces for tape composed by Fort. The secular harpsichord pieces of William Byrd narrate the account of a battle; electro-acoustic music illustrates these tableaux with sound images, created by a variety of sounds, voices, breath, from the most tenuous to the most grating. Both styles co-exist, live in parallel without necessarily being unaware of each other, the one being the point of definition for the other, the one being necessary for the existence of the other. In 1993 Bernard Fort again won the Bourges prize, this time for 12 Haïku and L'impatience des limites. He received the Villa Medici Fuori-i-Muri Prize in 1996 and developed, in Romania, a panoramic recording process from a boat in the centre of an immense lake. He thus sonorised an ordinary aquatic, autumnal landscape with impressions of great solitude, desolation and austerity but also of calm and balance in the work La paix de l'entendre. Lastly, the Chasseurs de Sons Prize of France Culture was awarded to him in 1994, 1995 and 1997. 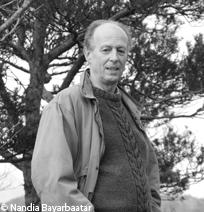 He since has given ever greater importance to his research into natural soundscapes (7 paysages canadiens, 1996; Danube sauvage, 1997; Les chants de l’Altaï, 2005). In parallel with his activity as a composer, Bernard Fort has devoted himself to sound engineering, editing, mixing and discographic production. He taught electro-acoustic music at the musicology faculty in Lyons II (1980-1990) and electro-acoustic composition at the École Nationale de Musique in Villeurbanne from 1982. He devotes the rest of his time to a passion for ornithology reflected in many of his works (Compositions ornithologiques, 1996; Fouillis d’oiseaux, 2008). Sauf mention contraire, les partitions de Bernard Fort sont inédites. FORT Bernard, GONIN Philippe. Du son à l'œuvre : un chemin vers les nouvelles musiques. Lyon : Editions musicales Lugdivine, 2002, 164 p.